Two Body Problem: OMG It Works! Sorta. Yesterday, I posted on my desire to be able to watch broadcast TV in my home theater without using an HTPC or buying any new equipment (like a standalone TV tuner). 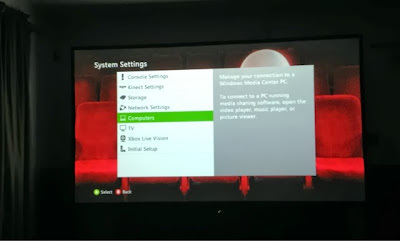 My plan was to install a copy of Windows XP Media Center Edition 2005 (MCE) on my former HTPC along with a USB TV tuner and use my Xbox 360 as a media center extender. It turns out my plan works (sorta)! Analog SD TV in all it's glory! 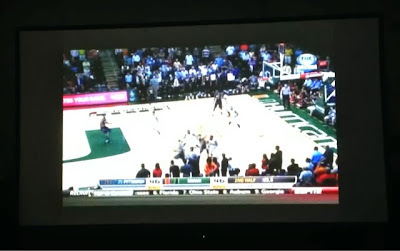 The short version is I am able to stream the analog standard-definition TV signal to my Xbox 360 from my MCE PC. Going into this I knew that the 2005 version of MCE required an analog tuner of some kind, even if in addition to a digital one. My USB TV tuner, the WinTV-HVR-950Q, is a hybrid tuner capable of tuning analog TV, over-the-air digital broadcasts, and clear-QAM digital cable signal. According to the TV tuner documentation, it requires at least the Windows Vista version of Media Center. Apparently, this is true, in that I haven't yet been able to get the digital tuner to work in MCE 2005, but the analog tuner is functional. There were a few hiccups. First of all, Microsoft does not make it easy to install the PC extender software in MCE 2005 anymore. Or if it is already installed, I couldn't find it. I was, however, able to find a link to the software from this page. After installing the software I was able to enter the 8-digit code from my Xbox and connect it as an extender. The next problem is I was unable to manually set up the tuner or the channel guide. When I tried, the Media Center program would lock up with ehrec.exe eating up 50% of the CPU. The problem with ehrec.exe eating CPU seems to be fairly common, but I haven't been able to resolve it yet. I think the next thing I'll try is to reinstall MCE rollup 2. I have a feeling that if I'm able to resolve this, I might be able to get the digital tuner to work. If it doesn't I'll start thinking if I want to do Plan B, which is to install Windows 7. I'm pretty sure this would be fairly straightforward to get working, but I'm not sure it's worth it. For what I would pay for a copy of Windows 7 (and probably an SSD so it will run on my old PC) I could probably buy a better PC with Windows 7 already installed. So what's in store next? When my wife and I have parties, we typically put on Kinect Party for the kids before dinner then a movie afterward. I got tired of switching playback devices so I re-encoded a bunch of the kids movies into an Xbox 360 friendly format and streamed them from my network storage drive, which has built in media server capability. In order to free up some space on that drive, I'd like to move the kids' movies to the HTPC backed computer and serve it to the Xbox. I'll either use the built in Media Center capability (I don't remember if there were limitations for this) or PS3 Media Server. Along the same lines, I have encoded some of the things my wife likes to watch on her iPad in an appropriate format. I plan on setting up iTunes on this computer so she can stream them to her iPad or one of our AppleTVs. Also, although the digital tuner isn't currently working in Media Center, it does work in other TV watching programs. Generally speaking, my wife and I mostly use various streaming services for our TV shows, but occasionally there are things I would like to record so I'd like to have that capability. In the old days, I was able to do this and strip out the commercials automatically. That would be a nice back from the dead feature. Perhaps I can re-encode them for iPad automatically too.